With FenceTrac, you pick your own style. 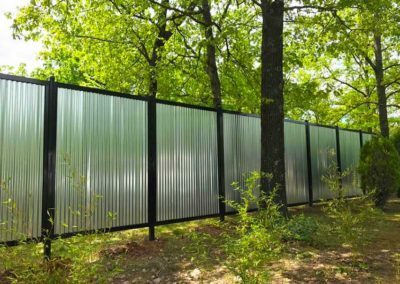 Our unique, patented fencing system offers residential and commercial property owners the ability to use nearly any type of infill. 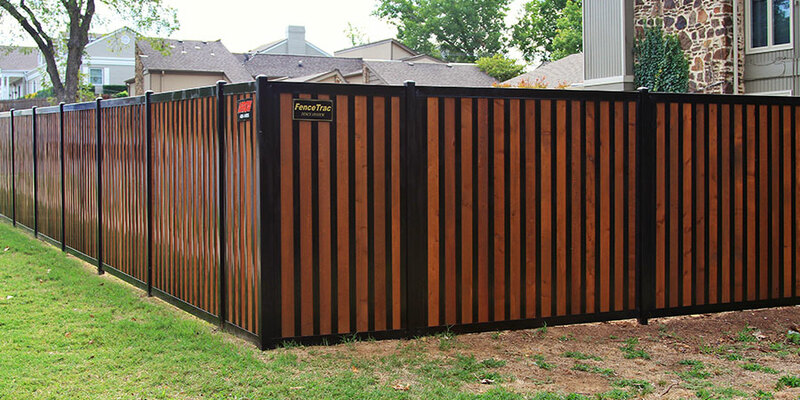 To create a truly one-of-a-kind fence that matches the look and style of your property. And lasts years longer than a traditional wooden fence. 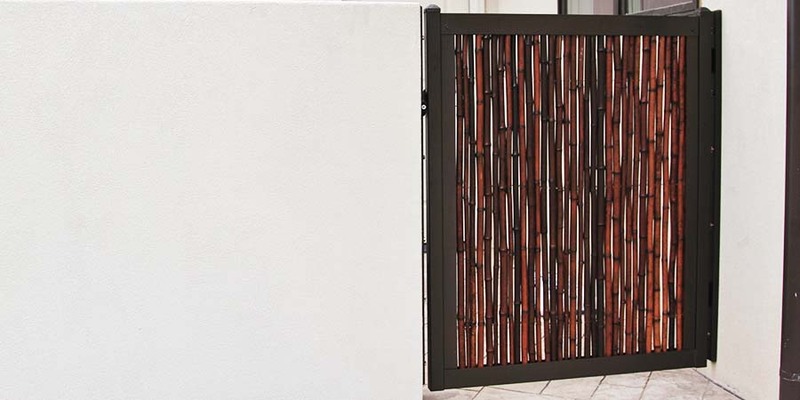 Standard FenceTrac is designed to be used with a variety of infill material placed vertically or horizontally. 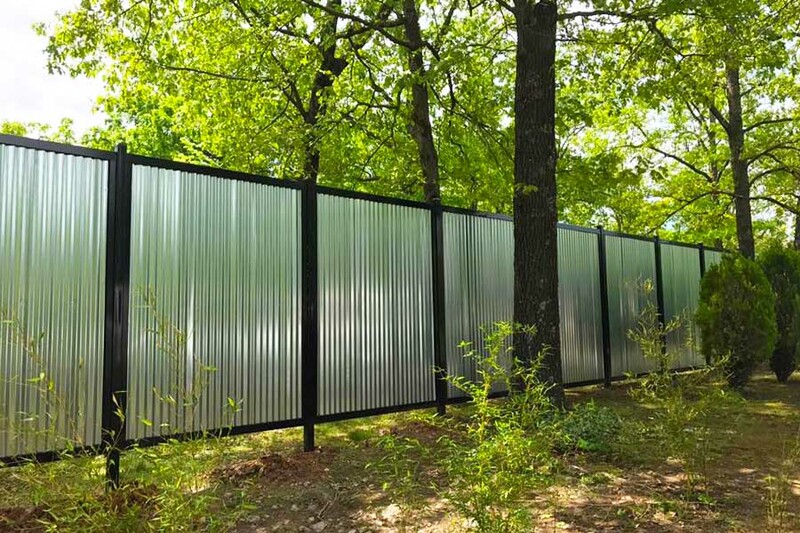 FenceTrac + H-TRAC incorporates vertical steel channels between posts to add more strength & a different look. Simple & fast assembly. 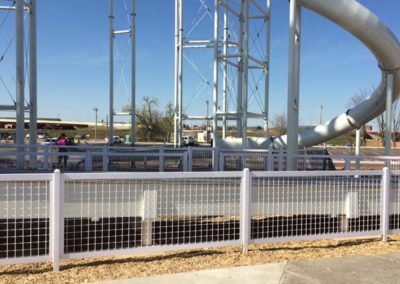 Infill materials slide into U-shaped FenceTrac rails. No need for hundreds of nails, screws, etc. If the need arises, infill materials can be easily swapped out or replaced by removing the top rail while leaving all other rails in place. 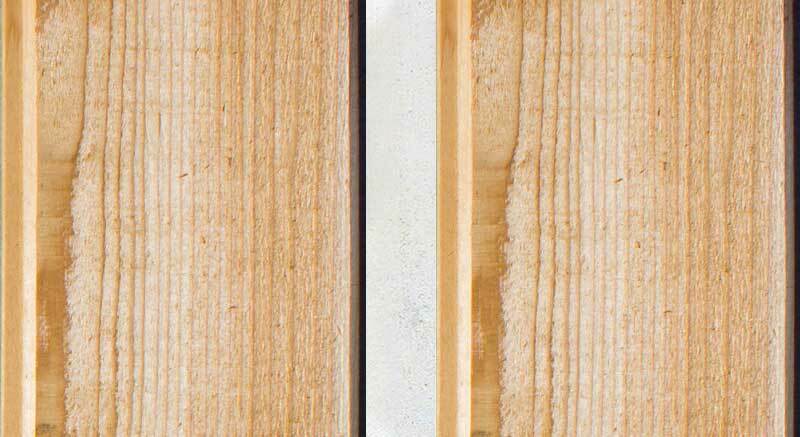 When using standard FenceTrac, we recommend tongue & groove infill to provide the most strength and privacy. 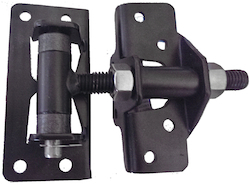 The standard FenceTrac kit includes: (1) Top Rail, (1) Bottom Rail, (2) Siderails (for post mount) and hardware to assemble metal components. Top & bottom rails are available in 72″ or 96″ lengths. Siderails are available to accommodate 48″, 72″ or 96″ panel heights. Patented FenceTrac U-channels are manufactured from galvanized 18 ga. steel for superior strength and durability. Bottom rails include weep holes to shed water. 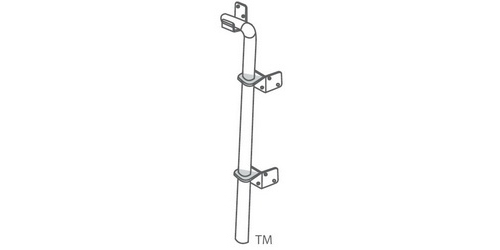 Mounting points include slotted holes for flexible installation tolerances. 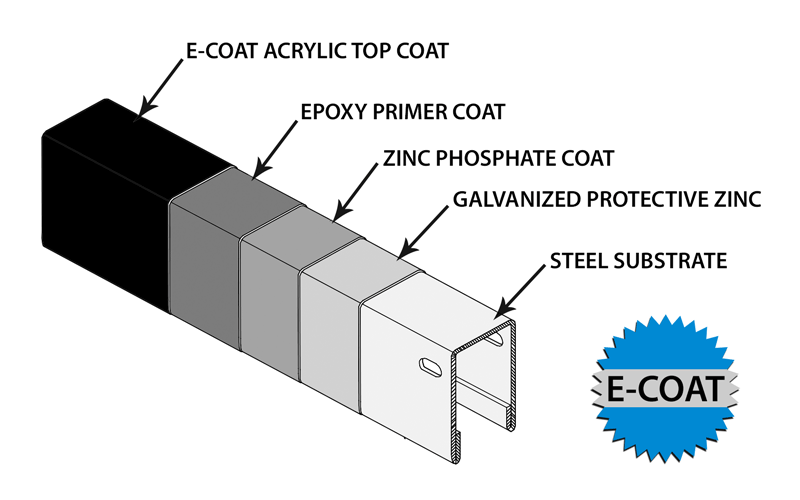 Black or Bronze FenceTrac is subject to a multi-stage pre-treatment/wash (with zinc phosphate) followed by a duplex cathodic electrocoat system consisting of epoxy primer, which significantly increases corrosion protection, and an acrylic topcoat, providing an industrial, weather-resistant finish. Optional colors include WHITE, TAN, or GREEN. These colors are subject to a thermal stratification coating process, beginning with a multi-stage pre-treatment/wash, galvaneal coating and heating process, and a separate electrostatic spray application of polyurethane powder coat finish. 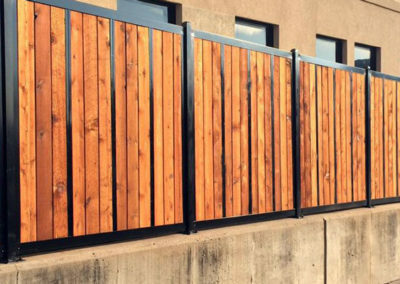 FenceTrac is designed to be used with nearly any type of rigid infill, so you can create the exact look you want. We offer standard infill choices, or you can source your own infill materials locally. 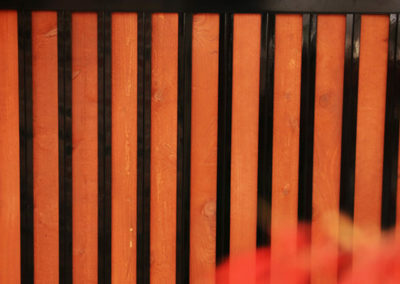 Our red cedar wood pickets provide a classic look with the added strength of tongue & groove rigidity. 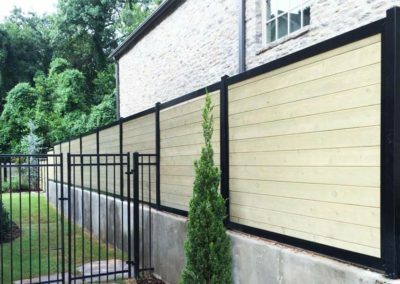 Composite fence planks made from wheat cellulose and recycled plastic available in gray or light brown. 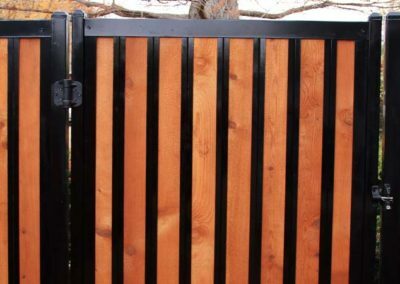 FenceTrac offers complete kits including: fence posts, hinges, gates and other hardware needed to build your fence. 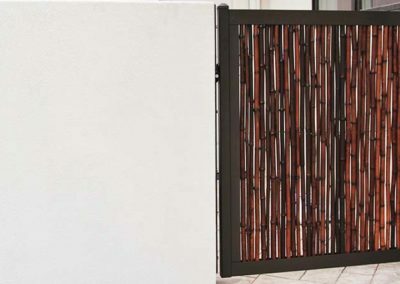 We also provide custom-built gates for specific requirements. 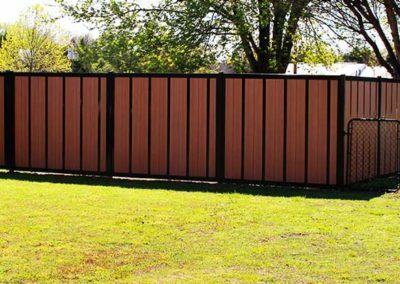 Heavy-duty steel fence posts are available from 2″ to 4″ square in black, bronze, tan or white. Includes pyramid-shaped cap. 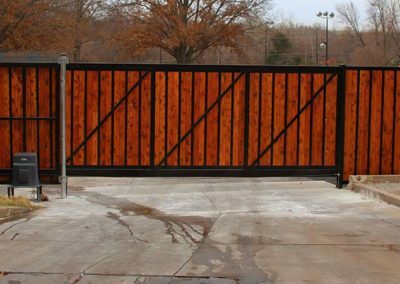 Gate kits are available in standard heights ranging from 4′ to 8′ tall and in standard widths ranging from 42″ to 72″ wide. ONE – Set Posts using specified length from Inside-to-Inside posts. TWO – Place Bottom Trac (with drain holes) on the ground between posts. THREE – Attach Post Tracs to the post by using supplied self-drilling screws. Insert Post Tracs into the Bottom Trac partially before drilling them into the Post. 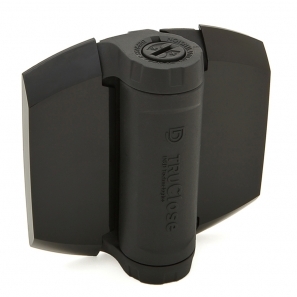 This helps installation of the Bottom Trac when it is close to the ground. Clearance is typically too tight to slide Bottom Trac in place after Post Tracs are attached. FOUR – Raise the Bottom Trac up to the Post Trac and align the slotted holes. Insert the bolt and nut into the Bottom Trac and hand tighten. FIVE – Before inserting Infill Material, notch the first and last pieces to clear the bolts and nuts. Recommend at least 1-1/2” x 1-1/2” of material be notched out. SIX – Insert first Infill into the Bottom Trac. Continue sliding Infill into place until you reach the last piece. If using H-Tracs, install using the same method as Infill Material. SEVEN – If using Tension Springs, install in Post Tracs with supplied hardware. EIGHT – Insert the final piece of Infill by sliding it from the top into the Post Trac (and if applicable H-Trac). The final Infill piece should also be notched before inserting. In some situations, the Infill itself may need to be cut down in width. NINE– Place Top Trac over the Post Tracs / H-Tracs / Infill Material. Insert bolts and nuts and then tighten ALL exposed hardware for finish.